I was wondering if any of your readers could recommend some good camping spots for parents with young kids (6 months + 3 years, currently). We're pretty flexible on most of the details (amenities, driving distance, etc), but would prefer to be near water. We had an Ask AOA question a bunch of years ago about camping spots -- but that was question specifically mentioned not camping with kids. And, of course, things change. So, got suggestion for Sean and his family? Please share! And as always, a sentence or two about why you're suggesting a place can be a big help. Here is some advice from someone who started camping with his kids when they were very young, like yours - pick a campground very close to home and lower your expectations. My wife and I laugh when we look back at that first camping trip - my son was 2, daughter 11 months, it was difficult to say the least. The biggest problem was uneven ground at the campsite - little legs tripping on rocks and roots and with each trip comes crying and tears. That being said, we now have a 9 and 11 year old who are camping experts, but we put in our time during those early years. There are several websites that show photos of a campsite (campsitephotos.com and campadk.com are two) - to give you a better idea of the actual site conditions and proximity to beach or bathroom. I've camped at Lake Harris in Newcomb almost every year for the past 10 years. It's pretty far from any kind of amenities but about 70% of the sites are on the lake. The campground has a pretty relaxed vibe to it, lots of families and kids riding around on their bikes. There aren't a lot of boats and you can rent canoes at the campground. Great Camp Santanoni and the Adirondack visitors center are nearby, there's a great hike for kids up Goodnow mountain to the fire tower. Long Lake is about 30 minutes or so away and it's about 45 minutes to Blue Mountain Lake and the Adirondack Museum. 1) GlimmerGlass State Park - On Otsego Lake, swimming, boating, playgrounds, drive car to site, etc, but still has a woodsy feel. Plus you can drive into cooperstown for the farmers museum and stuff. 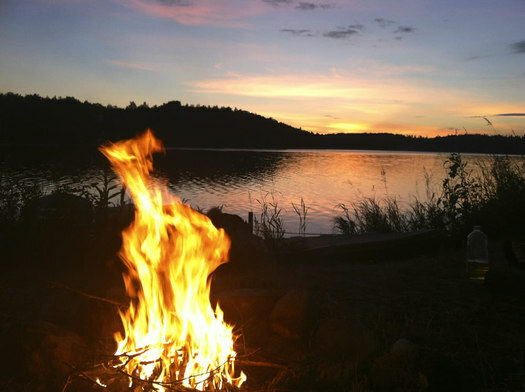 2) Saranac Lake Islands - Get a canoe or boat and get a site on an island or the lake shore. Sites are very spread out so you'll get plenty of solitude/privacy. 1. Lake George Resort - a bit pricer but lots of activities - crafts, games, etc. and amenities. They have sites for tent, cabin, and RV. It's just north of Lake George Village and has things like pedal cars, sports, games, fishing, access to Schroon river for tubing (can tube down the river to the campground - they bus you), boating, etc. 2. Battleground (NYS DEC campground). Walkable to Lake George Village; fishing, historic sites, better for tenting, though some RVs go there too. Very good facilities (bathroom, shower, sink, etc.) and low cost. Lots of families go here. Deer Run- very popular family campground with pools, slides, blow-up water slides, events, tents and RVs. I know several families that have spent generations coming here. I think a little bit of TLC to refresh some of the worn areas is needed - I think the new owners will take care of some of the aging parts. Very family friendly campground. Hearthstone Park in Lake George is great for kids! Thompson's Lake, Cherry Plain, and Moreau State Parks all have camping and lakes to swim in close by. We've brought my 7 month old to Dippikill Wildness Retreat twice already with great success. They have cabins and campsites to rent. There is a short hike to a pond, and free canoes. It's for the UAlbany community (students staff and alums) but who around here doesn't know a UA alum? Camp Little Notch in Fort Ann, NY has campsite rentals during some time periods of the summer when the girls summer residence camp program is not in session. Nice lakeside areas with platform tents and site houses, some enclosed with electricity and some lean-to style. Big, safe fire circles. Camp Little Notch grounds include the Mount Hope Iron Furnace, a Civil War era blast furnace. This is an easy hike - great with kids - of level ground with cool cellar holes and stone walls. It was also a landmark on the Underground Railroad. $10 a night per person (free for children under 6) for use of the platforms. Additional fee for waterfront use and lifeguard - ask when you register. Fathers Day Weekend will be a general Open Camping time. To check it out, the first Sunday Open House is May 22 from noon to 5pm. Camp Little Notch in Fort Ann is a great place for camping with kids. Membership is inexpensive and the structures on the property were designed for girl scout campers. There are nice hikes in and around the property, which has a waterfront and tent platforms for camping. When ours were super-young like that, we followed the advice offered above and camped close enough that having to bail and get home wasn't a hassle. For that, there's Taconic State Park (which has a very shallow water play area and a super deep one, so be advised) and Thompsons Lake up above Thacher Park. When getting to go further, we were fond of Glimmerglass near Cooperstown or Gilbert Lake, nearish Oneonta, which were both quiet (except for Hall of Fame weekend, or some big race down at Unadilla) and family friendly. We always camp at Kring Point State Park in the Thousand Islands. It is small, quiet in the early season, and they have great family bathrooms.